I’d heard of the Maverick Festival, but never actually been, so when this year’s seventh incarnation presented me with the opportunity to be there in person, and see the likes of Holly Williams, Larkin Poe and Mary Gauthier – I was in, for the Saturday at least. I had Kacey Musgraves in London on the Sunday, so staying for the whole weekend and making it to Shepherd’s Bush Empire in a state anything less than zombification, just wasn’t going to happen. So off I set, at around 11.15am on Saturday July 5th, and by 12.30pm I was driving down thoroughfares that describing them as roads might be little flattering. I was quick to blame my SatNav, who’s mission it seems is to take me to places where bunnies rule the land, and watch in bewilderment at the foolish human and his ill equipped vehicle. Turns out this was the way to Easton Farm Park, the very far removed location of this feast of Americana in the most rural of Suffolk. Walking into the Maverick Festival for the first was like getting to the secret hidden level on a computer game – I assume, I’m not actually a gamer. To my left was a barn, The Barn actually, with live music and to the right was a bar. Looking further down there were food stalls, including The Duck Truck, which I’d read about and lusted after a few months ago. Opposite this purveyor of fowl filled wraps was another stage, in front of which people sat on chairs, coats or even the just the grass. There was a feeling of relaxation and contentment, something that swept over me almost immediately and stayed with me until I left, to go down those windy roads once more. I will get on to the music, but anyone going to a festival wants to know about the really important stuff first – the loos! For starters, they were proper toilets, which were clean and working all day, albeit for a short period when the water stopped working in that building. However, there were portaloos elsewhere, and those to were clean and functioning properly too. Not only that, but even during this time of toilet block shut-down, there was no queue for the portaloos – decadence! The food was plentiful, ranging from the aforementioned duck wraps to curry or noodles, vegetarian and stone baked pizzas. I ended up being really boring and having two duck wraps, on different occasions – not all at once. These were £5 each and the girls serving put as much duck as is humanly possible inside those wraps, and then threw on some hoisin sauce, cucumber and spring onions too. Am I waxing just a little too lyrically about these wraps? Maybe, but they were fantastic and worth every penny. Water cost me just £1 a bottle, and I say just, because at other festivals I’ve paid 2, 3 and 4 times more than that. There was plenty of beer, cider and lager on sale, and all cheaper than my local pub. Had I not been driving I’d have sampled a few. The grounds themselves, even after being subjected to a night of rainfall, showed no signs of mud and thus my wellies stayed in the car, an unnecessary accessory. To get from the entrance right to the back of the entertainment area was just a few minutes walk, and on the way there were a couple of other indoor venues playing a wide range of music, and I think there was even a small busking / open mic stage near the loos. 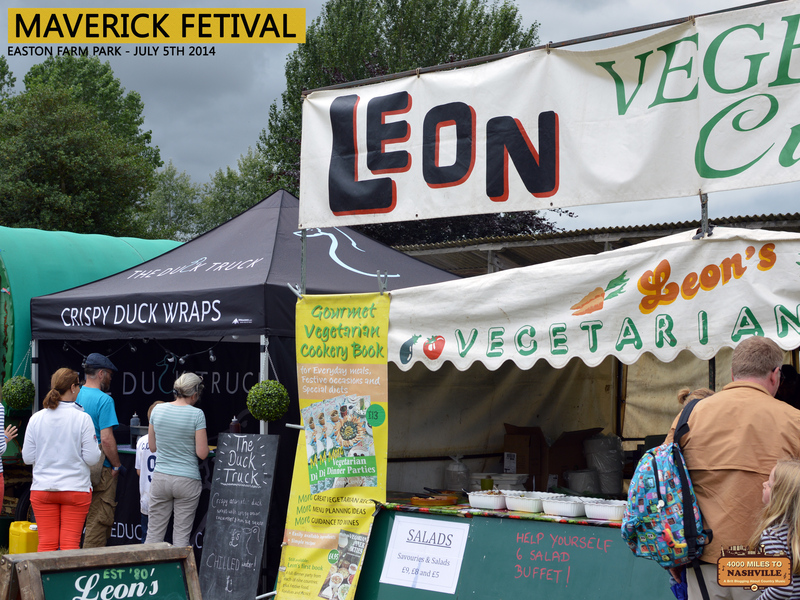 In the 11+ hours I was at Easton Farm Park for the 2014 Maverick Festival I encountered only friendly staff and visitors, well looked after facilities and more quality food than I’d have time to try if I stayed for three weekends. I was in the overspill car park and even that was directly opposite the entrance. When we did have rain, those that din’t stay put regardless, found shelter in the roofed venues, but the extra influx never made them over crowded. The only thing some might struggle with is the lack of network connection. But to be honest, after I’d recovered from the initial panic of being disconnected from the outside world, I embraced the chance to just enjoy the music and actually talk to people, face to face. My first taste of the buffet of fine music on offer came when I sat in The Barn, the main venue, to get away from the rain. I know, what a wimp! I sat myself down at the very front, to the side, and got 2 of my 3 cameras out ready to snap whoever it was that was about to take the stage. 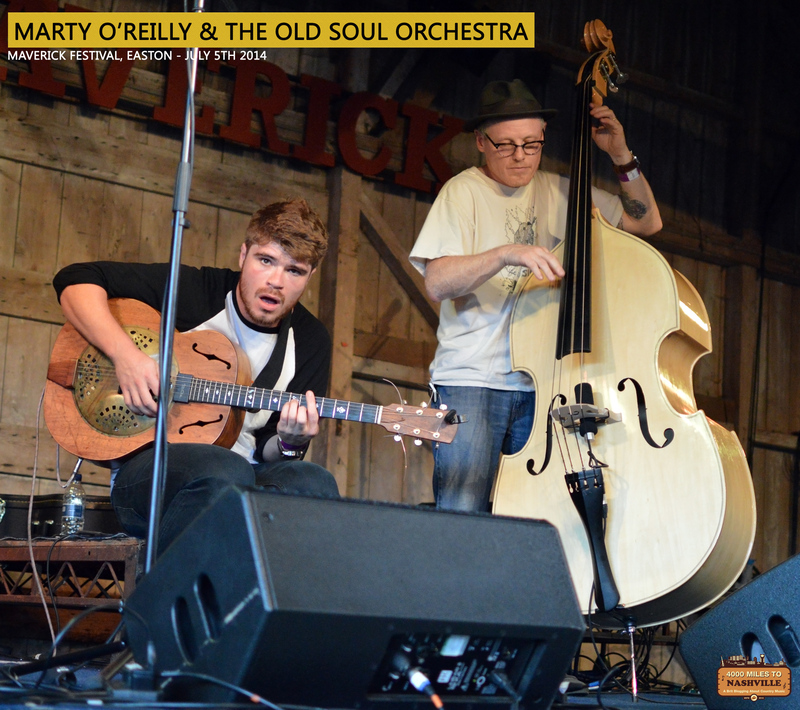 I turned out to be Marty O’Reilly & The Old Soul Orchestra, and I couldn’t have had a better welcome to Maverick Festival as these guys put so much effort into their bluesy songs that Marty himself must have lost a few pounds during the performance, as sweat streaked his beautiful guitar by the end. Anyone who thinks music isn’t physical just needs to watch these guys, and you’ll see a guitar, fiddle and double bass played to within an inch of their inanimate lives. Marty’s voice is strained to the very limit, but never so far that’s it’s painful or forced. Chris Lynch on fiddle maneuvered his trainers off whilst still playing towards the end, and I never did catch up with him to ask why. With Jeff Kissell on double bass, Marty and Chris put on 40 minutes of raw musical excellence, that really set the tone for the rest of the day. After a stroll around the grounds I was back in The Barn for The Goat Roper Rodeo Band – yes, that’s the actual name of a band, and what a cool one at that. I’ll admit, when they were warming up I was a dubious about whether they would be my cup of tea. However, once they’d started their country blues, with lots of energy and great skill, I was drawn in completely. Never let it be said that a double bass can’t be wielded around a stage like a guitar or fiddle, because that’s exactly what Tom did, while Jim and Sam made their guitars purr. The vocals were almost nasal, but incredibly distinctive and perfect for their sound. Definitely a band to look out for. One duck wrap later and I was stood to the left of the new for 2014 Sweet Home Alabama Stage to watch the Rainbow Girls – a band I knew nothing about other than Marty from earlier had talked about being on tour with them. It is getting harder and harder to put acts into genres, but I couldn’t even put any of their songs into one. They bring such a mix of styles and influences that for anyone else it would be a mess, but for them it works, and only them. Their mix of folk, funk, stomp and the kazoo made for perfect Saturday afternoon music. 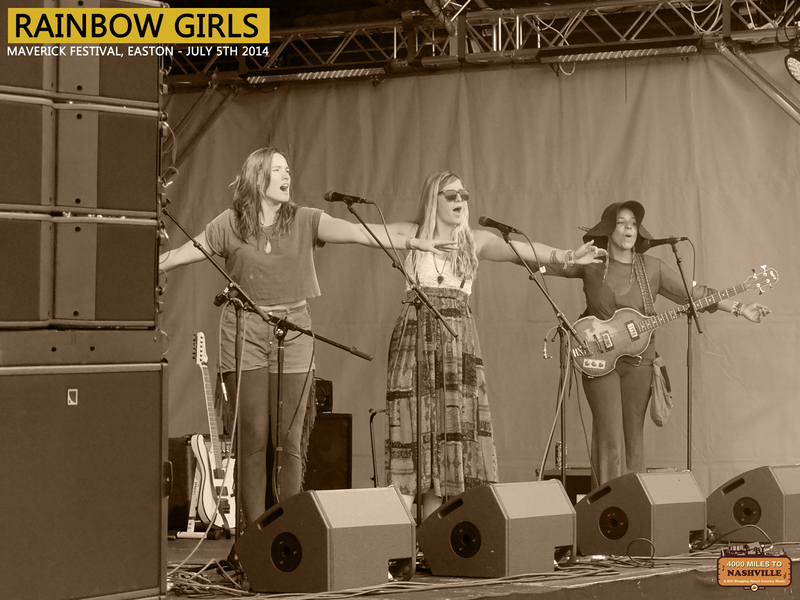 For a start I’ve never seen band members move round and play different instruments like these 5 girls from California. Cheyenne Methmann played 5 I think, including the washboard used more effectively than I have ever witnessed. They had so much fun on stage but at the same time making beautiful music – I smiled throughout their whole set and their happy aura is hugely infectious. I came away with their CD which they happily signed, and have been playing it over the last few days. It’s just as crazy and brilliant as seeing them live. 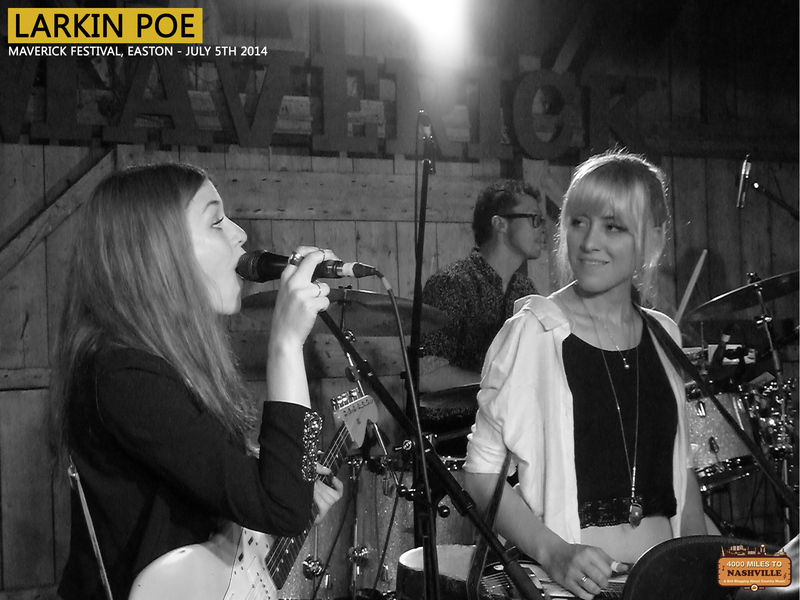 There was a break in the music as I interviewed Larkin Poe, which will be published at a later date. All I will say is that they were utterly delightful and it was both fun and informative – what more could I ask for? I did manage to catch the very last of Ward Thomas‘ set, which sounded really good, and they seemed to be having a great time performing. 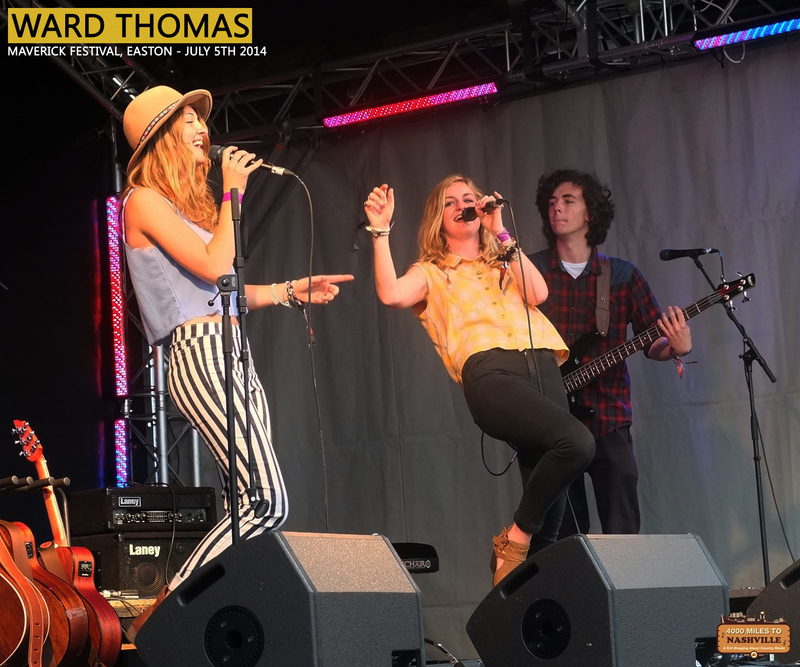 I’m seeing them at The Green Note on July 25th, so not long until I get the full Ward Thomas experience. Only one song, but I did manage to take possibly my favourite photo of the weekend. Another duck wrap and it was off The Barn where I would stay until the end of the night. 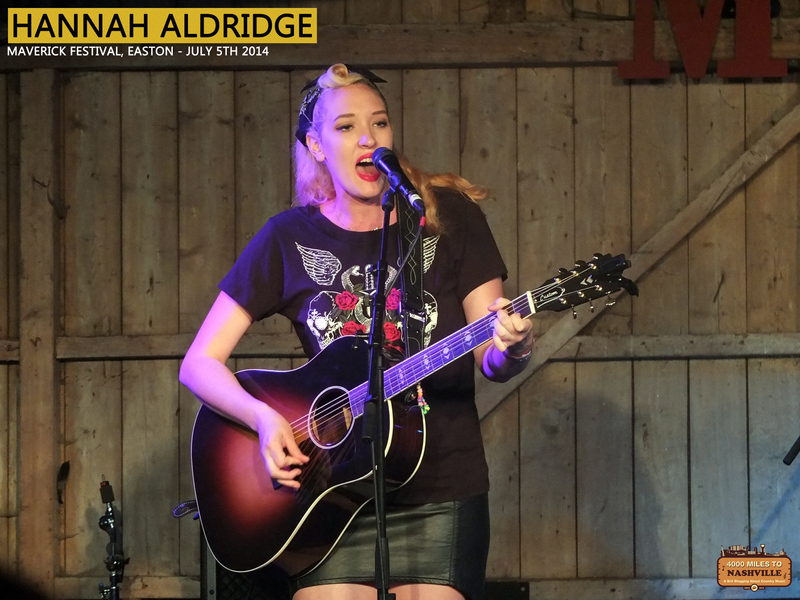 First up in this evening of four acts was Hannah Aldridge, who I hadn’t heard of but David from Three Chords and The Truth had recommended I see perform. Hannah made for a striking figure with her 50s inspired styling and skull adorned t-shirt. What followed was a set of songs that have been very obviously written from the heart about her life experiences, and delivered with a beautiful strong voice that screams honesty. Hannah’s stories in between songs were both funny and heartfelt, and with her music make her someone that you want to watch perform, go for a drink with and be a just a tiny bit afraid of, but only if you piss her off. It was just Hannah, her guitar and her glorious voice, and a set that was a little more country than her album, so I was told. From the recently documented Muscle Shoals, Hannah is a captivating performer who once seen has to be seen again and again. She is planning a tour back to these shores in Autumn and you can count me in. I’ll also be seeking our her album, as I didn’t get one on the night for fear of losing my place to see the next act. 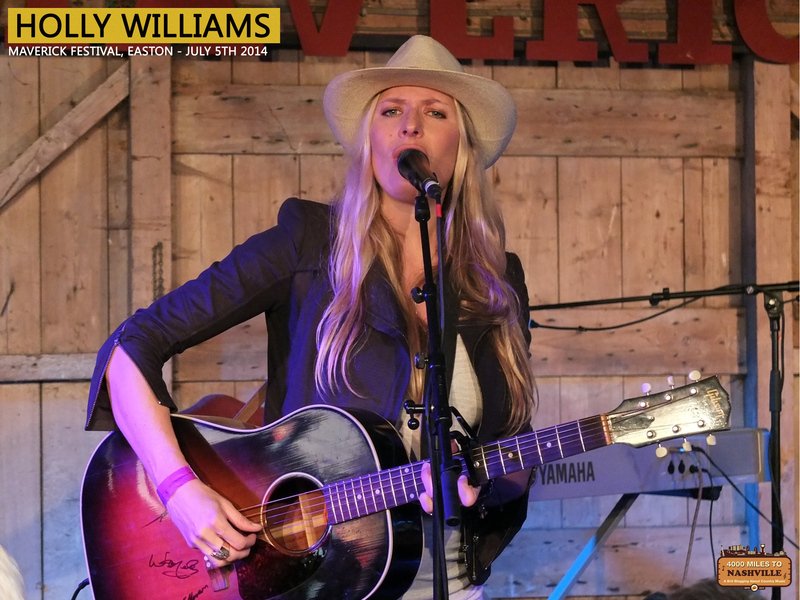 That next act was country music royalty, as Holly Williams took the stage, looking as serene as ever. She talked of her new album The Highway, though new to the UK it may be, it’s been out for quite some time in he US. Watching Holly sing was an almost surreal experience, as beautiful doesn’t do her voice justice. Though having the lineage, this is a young lady who hasn’t ridden the coat tails of her family name and talked of her farmyard upbringing and the other side of her family. It was the title track of her album The Highway which was the highlight for me. At least of her own songs, as finishing her set with Hank Sr’s I Saw The Light was the dictionary definition of crowd pleaser, and a great way to end her time on the Maverick Festival Stage. When performing Holly would often close her eyes and you could see on her face how much the music means to her. As before I didn’t want to lose my place, and as such I lost my opportunity to buy her album on vinyl, and get it signed too – damn. 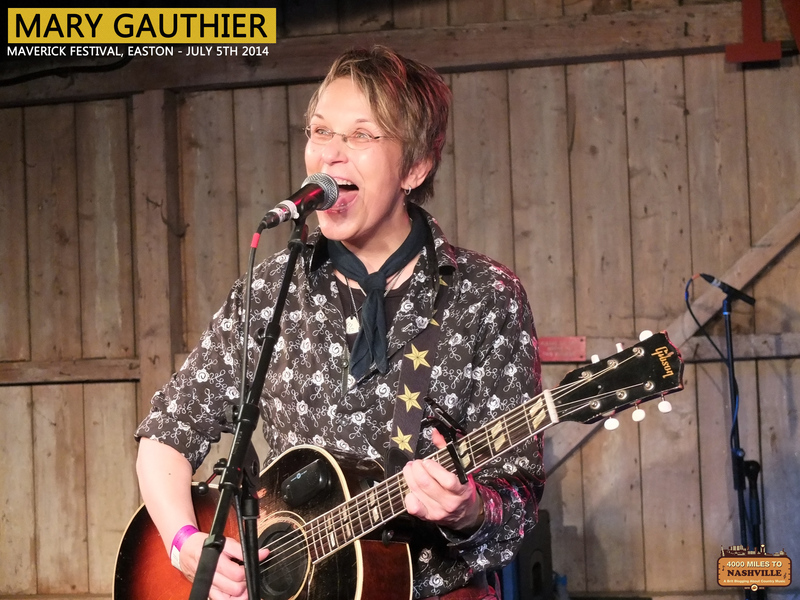 I have a confession to make – I didn’t know Mary Gauthier until hearing she’d been announced for this year’s Maverick Festival and hadn’t heard her music until this past Saturday. From the few bits I read I knew she was held in high esteem, by both her peers and fans. On stage to sort out her own set up, she looked quite unassuming, but once she started to play, it all became very clear. I love storytelling in music, and it baffles me when artists don’t see its importance. Mary is the epitome of what I love, and the songs she creates are poetry to music. Mary has a voice of utter believability, so much that songs about pain strike a blow straight to your heart, and you feel the song like it’s a physical entity all around you. Quite often I talk of people being lost in their music, well that now needs to be referred to as the Mary Gauthier scale, for none do it quite like her. Mary’s rapport with the audience has me smiling just thinking about it. If ever she gives up music, which I hope doesn’t happen, then a career in stand up comedy awaits her. Mary is an engaging character, who when not singing had us all in stitches. One of the biggest accolades I can give Mary, is that going in I didn’t know her music, but halfway through songs like I Drink and Another Train I was sure I’d been listening to them for years. You see, Mary Gauthier doesn’t just sing to her audience, she gets them involved and for those who might not know the words, she helps us out. After an hour of watching Mary perform on stage I knew I’d just experienced something very special, and seen one of the very best singer songwriters around. I now understand why she is so well-regarded, and you can count now me in as one those doing the regarding, if such an expression exists. Last on were Larkin Poe, and after seeing and meeting them at their gig in Essex, and then interviewing them that afternoon, I felt like I was watching friends. After an extended sound check they were under way, and what a way to end an incredible day of music at Maverick Festival. Having seen them just a week previously. I knew what to expect, a brilliant combination of southern rock soul, performed by the ever brilliant Rebecca and Megan Lovell. I had been listening to their new album KIN over the last week so knew the songs better than most in attendance. Tracks like Don’t, Crown Of Fire and High Horse sounded fantastic played in The Barn and the crowd lapped them up. Read the review of their Essex gig to read more in depth what I think of Larkin Poe live, but I do need to once again highlight the incredible skill of Rebecca on mandolin and guitar, and the virtuoso that is Megan on slide guitar, as well as their fantastic vocals too. They had everyone singing and dancing and I was pleased to say their stories in between songs were not word for word what I’d heard 9 days earlier – hats off for that ladies. With Robby Handley on Bass and Marlon Patton on drums, Larkin Poe gave us the final hour that we all wanted and nobody else could have provided. they were so good that I forgot my legs hurt from stood in almost the same spot for nearly 6 hours! My first thought when walking away from The Barn and towards my car, as people drunk and chatted around me, was that next year I want to come back and stay for the whole weekend. Let me put that in to perspective – staying would mean camping, something I’ve not done for 23 years, but that’s how much I enjoyed Maverick Festival. The music choices were perfect, and I only got to see a fraction of what was on offer. Throw in an impeccably organised event, a whole bunch of well-natured and like minded music fans and you have as good a music spectacular as I have ever had the pleasure to experience. Roll on Maverick Festival 8 – I’ll be going, and so should you. Holly Williams would have been the absolute highlight for me. Her voice is superb. She nearly died in a very bad car crash a few years ago and her sister is disabled due to it. Did she sing “Waitin’ on June” a must hear song. I too have planned to go to Maverick but never yet been. Your review has made up my mind to go next year. Do go next year Ben. I went on the Saturday for the first time. I’m a confirmed indoor small venue person, but as I left I was kicking myself that I hadn’t been before and hadn’t gone for the whole weekend this time. Definitely doing it under canvass next year. BTW, Holly absolutely stormed it. She said she’d had a great day in site before playing and she was absolutely on the top of her game. Outstanding. Great review, it matches my own thoughts.